Given that our running days overlapped for quite a number of years, I should really have known more about this remarkable runner than I do. There are some moments that spring to mind such as the time several of us went in Jimmy Scott’s minibus to run in the Brechin Rights of Way race and on the way up sorted out in our own wee heads who the first three or four would be. Then into the room where the entries were being taken strode Steve Taylor, Dennis Whiting and another AAAC runner and the ball was up on the slates. First three places gone with the wind! Anyway the following account of – and tribute to – Steve’s running career has been written by his friend and team-mate Colin Youngson. Stephen Taylor (universally known as Steve0 is an Aberdeen AAC legend. Perhaps he is best known as Alastair Wood’s most important training partner and friend; but there is a lot more to Steve’s impressive athletics career than that. As well as being a very talented elegant runner, he had considerable success over many years at distances ranging from one mile to thirty! In addition he was fantastically strong in training: and a captain who truly led by example when his beloved distance-running club proved to everyone that it was one of Britain’s very best. During his best racing years, Steve was advised by his long-term coach, the great Gordon Pirie (world record-holder for 3000m and 5000m and Olympic silver medallist at Melbourne). He also met Alastair Wood, born in Elgin, an Aberdeen University and later Oxford University Blue at both athletics and cross-country, a GB International runner and one of the most charismatic and outspoken characters anyone could hope to meet. During his RAF career, Steve represented the Services in most of their major cross-country races, most notably the annual fixture against the Midland Counties and the Universities Athletic Union which featured several English CC Internationalists, including Ron Hill and Bruce Tulloh (who also ran once for Scotland). After leaving the RAF, Steve returned to Aberdeen and became a member if the fledgling Aberdeen AAC. As he states in his book: “We Have To Catch The Ferry”, which is a personal reminiscence about AAAC mainly in the 1960’s, their first notable win was in 1959 when they won the East of Scotland Cross-Country Relay Championships, pipping holders Edinburgh Southern Harriers. That summer in the SAAA Championships, Steve Taylor won a bronze medal in the One Mile, behind Scotland’s finest miler Graham Everett. A somewhat unusual but very popular competition at the time, sponsored by the ‘Athletics Weekly’ was the two-man, ten-mile track relay or paarlauf (which entailed each runner completing 40 x 220 yards with a minimum of rest, often just a jog across the middle of the track). John Gray and Steve Taylor finished second in the British rankings, beaten only by the Portsmouth duo of Bruce Tulloh and Martin Hyman, both of whom became very important and very successful athletes. Remote the city might be, but Aberdeen runners refused to be undervalued. Despite being best known initially as a middle-distance runner, Steve Taylor made quite a mark in Scottish cross-country circles. Aberdeen AAC usually managed to win the North-East Cross-Country League (with Steve himself being a frequent victor). In 1961 Steve Taylor, the race winner, led his team to success in the annual Carry Trophy event between the selects from the cities of Aberdeen and Dundee. That was the year when Steve finished second to Adrian Jackson in the East Districts Cross-Country Championships; and in 1962 he was second once more behind his new team-mate Alastair Wood, who had switched from Shettleston Harriers. Eventually in 1967 Aberdeen AAC succeeded in winning the East District team contest and Steve was fourth counter. Wood and Taylor had actually had been training together since summer 1960, when the former moved to Aberdeen and took up a teaching post. Their running partnership not only led to great success for both individuals, but also inspired many Aberdeen runners for considerably more than 20 years. In the National, contested over nine exhausting miles at Hamilton Racecourse, he had a succession of good placings: 1960: 7th in his first season as a senior; 1961 – 4th; 1962 – 4th; 1963 – 6th; 1964 – 7th; 1965 – 9th. Aberdeen AAC’s best team placing was second, not only in 1962 but also in 1964 and 1965 – a remarkable feat for a club with only a handful of dedicated athletes. Steve himself represented Scotland in the International Cross-Country Championships three times in a row (1960-62) at Hamilton, Nantes and Sheffield, respectively; and only a bout of ‘flu in 1963 stopped him participating once more. Steve’s best run in the International was 35th (3rd Scot) in 1962. In 1968 he was 18th in the National, and fifth counter in a valiant AAAC team which only lost by one frustrating point in a classic encounter with the brilliant Edinburgh University outfit which was completing a third successive National triumph. In the 1960 Edinburgh – Glasgow Relay, Steve ran particularly well to move AAAC up six places on the long Sixth Stage (achieving a fastest time only 24 seconds slower than Scottish distance running legend Ian Binnie’s record). Steve’s club held on to that position, finished sixth and were awarded the medals for the most meritorious performance in the race. Steve Taylor’s longevity and consistency is evident from the fact that he took part in this wonderful event every year from 1960 to 75 apart from 1973. He ran for Aberdeen University in 1974; but AAAC on every other occasion. Another fine individual performance was fastest time on the Fifth Stage in 1967. Aberdeen AAC’s best positions were: 3rd in 1963; 2nd= in 1967 and 2nd in 1968 and 1972. The club finally won three times in the 1980’s but Steve’s team mates included luminaries such as Alastair Wood, Mel Edwards, Bill Ewing, Sandy Keith, Rab Heron, Don Ritchie and Graham Laing, not to mention Peter and his even-more-famous brother Ian Stewart (from that little known suburb of Aberdeen called Birmingham) whose untouchable 1972 record in an Aberdeen vest on the second Stage must have been the most marvellous performance in the illustrious history of the event! Steve Taylor’s best performances were frequently on the track. In 1960 he won the East District mile title, as well as the subsequent Inter-District mile in Glasgow. In that year’s SAAA championship he improved to second in 4:10.4, one of the fastest times recorded by a Scot at that time. In the Invitation International Mile at the prestigious Rangers Sports at Ibrox Stadium , Steve represented Scotland, along with Graham Everett. They faced an elite field of Olympic contenders including former world mile record holder Derek Ibbotson and Laszlo Tabori of Hungary. Steve agreed to make the pace and there is a colour photograph of him doing so. He took the field through 880 yards on schedule. Tabori won in 4:01.1 with Steve eventually finishing in 4:10 once more. 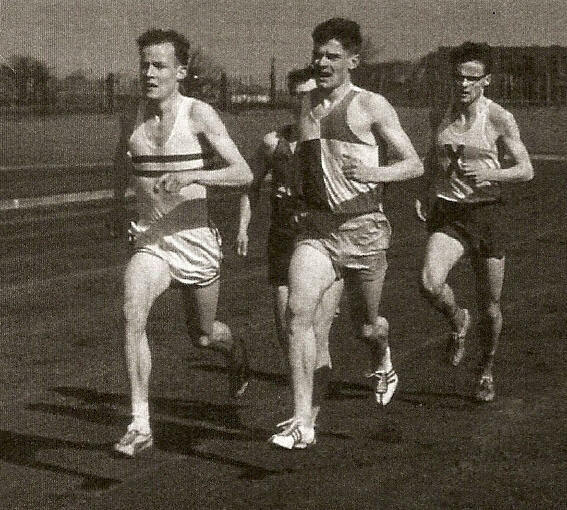 In 1961, having won both the mile and three miles in the East of Scotland Championships, establishing a championship record in the longer event, Steve Taylor went on to defeat his team-mate Alastair Wood to win the SAAA Three Miles title – his first National gold medal. Aberdeen AAC’s four-man team was a very good fourth from the twenty clubs invited to the Inter-Club Three Miles event at the Vaux International meeting at Gateshead. This was enhanced by the presence of the famous coach Arthur Lydiard and his Olympic champions Peter Snell and Murray Halberg. Steve enjoyed the thrill of an early Sunday morning run with the 5000 metres champion Halberg, a most self-effacing man who overcame the effects of polio as a child to become truly a legend in his lifetime. Then Steve Taylor ran for Scotland against Ireland and Wales in the Triangular International in Cardiff. He finished a close second to Welshman Dave Richards, who set a Native record of 13:48 in front of Steve’s personal best 13:51. In the Edinburgh Highland Games at Murrayfield Stadium, in the Two Miles, the Aberdeen pairing of Wood and Taylor finished 1-2 for a Scotland Select versus a West German Select. Having retained his East District Three Mile title, edging out Alastair Wood and setting another Championship record in the 1962 SAAA Championships Steve Taylor not only improved his personal best to 4:09.5 for the Mile but also retained his Three Miles Scottish title, winning by over 100 yards. He was very unlucky not to be selected for the Empire Games in Perth, Australia. However Steve did run the Three Miles for Scotland against Ireland in Belfast, the Two Miles against Holland, where Steve and John Linaker finished 1-2, and representing ‘Edinburgh’, the Two Miles against ‘Munich’ at the Edinburgh Highland Games where Steve and John achieved another 1-2. In 1964 Steve Taylor won bronze in the SAAA Six Miles won by that year’s Olympic 10000 metres runner Fergus Murray. Then in 1965 it was silver in the SAAA Three Mile for Steve behind future Commonwealth 10000 metres gold medallist Lachie Stewart. I must have met Steve in 1966 and until the early 1970’s as well as being very impressed by his training speed on Sundays, I trailed in behind him in many cross-country events and several track races, not only in championships but also on the grass at King’s College and the Huntly Highland Games. In 1969 at the Forres Highland Games, Steve (who was brought up at Kintessack only three miles away) was retaining his North of Scotland 3000 metres title while I was plodding through my debut marathon in 2:41:13 to finish third about 14 minutes behind AJ Wood. However Steve’s focus was beginning to switch to really long-distance racing. 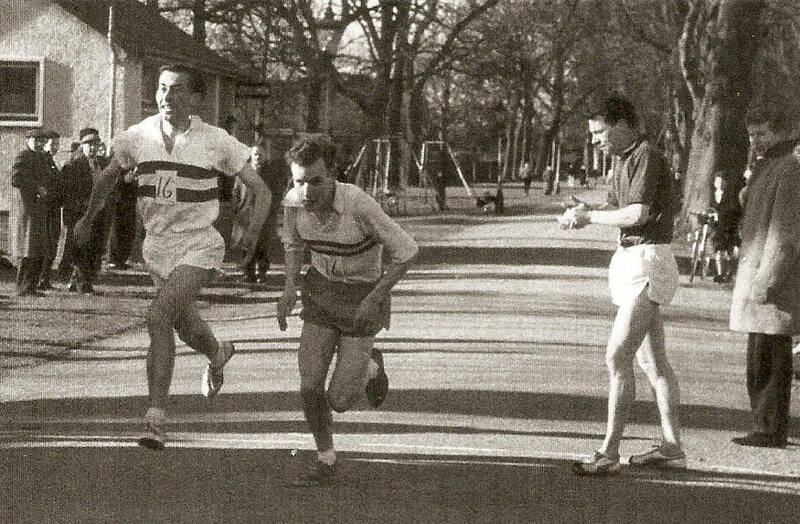 The infamous Sunday Run – undoubtedly the key session in the ‘Aberdeen Training School’ began in the early 1960’s. In his book, Steve asserts that these were not as lightning fast as legend insists. However I would disagree, having first tried them out when I could barely handle six miles, as a callow and probably hung-over ‘Fresher’ at Aberdeen University. The group met at Ally Wood’s house in Cairnaquheen Gardens. Just round the corner was King’s Gate, a very steep hill followed by a roundabout and a slight rise to the gates of Hazlehead Park, then along to the bus terminus, followed by a half circuit of the pony track, a long stretch of rustic road, fun and games in the forest trails and an arduous bash on the roads back to the city, finishing with a two-mile sprint in from Cults, plus another mile or two warming down, pretending not to be knackered. 13 to 15 miles – and quite far enough. In the early days, I could be off the back by the roundabout! It really was a de’il-tak-the-hinmost! The fitter you got the longer you could hang on. Ally tended to motivate by ignoring you, then insulting you and finally by saying nothing. Steve by contrast was always encouraging, but seemed to reserve Sundays for a demonstration of astonishingly relaxed speed and stamina, despite insisting that he had retired from serious running in 1966! He made even Mr Wood suffer more often than that gentleman cared to admit. Even in the 1970’s when I could often beat Steve and Ally in races, they could run away from me if I dared to visit my home city on Sunday mornings! As early as New Year’s Eve 1960, Steve Taylor showed real potential in a long road race – the famous Morpeth to Newcastle. Having arrived late and started at the back of the 120 strong field, in the closing stages he was ten yards in the lead before losing valuable seconds due to his unfamiliarity with a ‘quirky’ finish to end up in a still very good fourth place, behind the winner Laurie Sykes and Olympic marathon runners Arthur Keily and Brian Kilby. Then in 1964 he was a close third behind Alastair Wood in the 13.5 mile road race at the Athol and Breadalbane Agricultural Show when the course record was smashed by two and a half minutes. In 1970 Steve Taylor won his third Scottish track title: this time the 10 Miles event on the cinder track at Scotstoun, Glasgow. His time was a good 49:53 with his team-mate Donald Ritchie a minute behind in second place. Then in 1971 Steve at long last investigated his ability to run a marathon. On 8th May he won his first one, the Shettleston Marathon in 2:23:25, just six seconds in front of Donald Ritchie again. On 13th June in the European Championships trial – Manchester’s Maxol Marathon (the ‘London’ of its day in terms of sheer quality at the front) he broke the 2:20 barrier to record 2:19:28 for 17th place, one in front of the following year’s Olympian Donald Macgregor. If only Steve had tried this distance a few years earlier who knows what he might have done! Steve also came 5th in the SAAA 10000 metres and fifth in the SAAA 10000 metres, and fifth (11 miles 1603 yards with Alastair 22 yards in front and Donald Ritchie another 57 yards in front of him!) in a one hour event at Meadowbank which was won in a Scottish National and Native Record (12 miles 616 yards) by Jim Alder from Pat Maclagan (12 miles 400 yards). However Steve did beat Jim Wight and Bill Stoddart, the 1970 Scottish marathon champion. In 1972 Steve took part in another long-distance track race at Walton in Surrey. 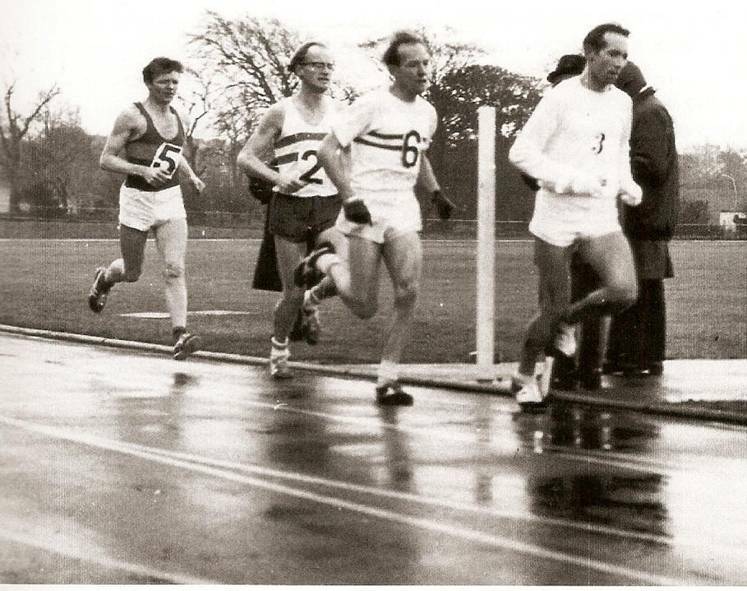 This was a 20 miles event won by Jim Alder in 1:40:50 ( a Scottish National Record) with Steve being timed at 1:45:40 some distance in front of Donald Ritchie. A good result in 1973 was second (2:23:17) to his flying club-mate Rab Heron (2:17:07) in the Edinburgh to North Berwick Marathon. However Steve badly injured a heel in this race and consequently retired from long-distance road running. Steve remains a good friend of mine, a sensitive, enthusiastic man with wide interests. My memories of him include youthful ones of sheer awe at his talent and dedication. In addition I was horribly impressed with him in the 1973 John O’Groats to Land’s End Relaywhen he was team captain. This was Aberdeen AAC’s second attempt. We had missed the record by half a frustrating hour the previous year; but this year despite having a weaker team we made no mistake and beat it by half an hour. The whole idea had been Steve’s and he had driven both events, arranging sponsors, organising , and – that word again – encouraging us all. I was lucky/unlucky to be paired with him. At the time I could usually beat him in races. However before we were halfway to the finish, I was struggling to match him for stamina, and often uncomplaining he did more than his share of our two-hour stints. His quiet steely example motivated us all to succeed. Steve Taylor continued to train, and occasionally race, for many years thereafter. As I explained he was always a hard man to keep up with on Sundays! Eventually he retired to Aberlour in Speyside and particularly enjoys striding out on long-distance walking trails. His usual companion these days is another sporting former pupil of Aberdeen’s Robert Gordon’s College, the ex-European champion swimmer Ian Black. Steve training was also influenced by Gordon Pirie and he has kept the correspondence from which he has allowed us to publish some of the letters. Colin Youngson wrote it up and it can be found here.